The re-election of President Obama has left most conservatives in a very pessimistic frame of mind. How could the majority of voters not see Obama had failed to prevent ongoing economic stagnation and the threat of bankruptcy? How could they endorse additional layer upon additional layer of bureaucratic intervention when the economic results were so awful? Donald J. Devine was Ronald Reagan's pick to head the Office of Personnel Management and is today vice chair of the American Conservative Union. You might see him as the personification of the pessimistic frame of mind. Several years ago he approached me for support for his just-announced campaign for Congress against Maryland's Steny Hoyer. When I asked him why he was running, his answer was as funny as it was honest. "I don' know ... uh...why I'm ... uh... doing this," he said almost woefully in his deep Brooklyn accent. Then he cracked his trademark smile. "Ya want to talk me out of it?" I procured for him a maximum contribution. Indeed, Devine is not a pessimist. He is a realist, a serious thinker who is fiercely honest, and he loves his country. The timing is right for his new book, "America's Way Back." It lays out the course for a conservative intellectual renewal, to renew the nation by renewing her best traditions. Devine is blunt in a time where blunt thinking is shunned in favor of cauliflower nothingness thought. He argues forcefully and convincingly that not only is liberalism corrupting the Democratic Party, it has infected the Republican establishment as well. George W. Bush’s big-government conservatism led directly into Obama’s “fundamental transformation” installing a more socialist vision of America’s future. After the massive intervention called TARP, Devine noted the program’s inspector general Neil Barofsky concluded that the federal response was not at all carefully considered and scientific. Referring to the $45 billion bailout of Citigroup, Barofsky wrote, the “consensus appeared to be based as much on gut instinct and fear of the unknown as on objective criteria.” Liberals joke about the “magic of the marketplace” as a fanciful concept, but why should anyone have faith in the “magic” of aggressively political management of the economy? Devine argues that the country needs both the dynamism of freedom and the roots of tradition, and a balance of these two ideals has been the “source of America’s historic creativity and prosperity.” Combining the traditionalist and libertarian strains of political philosophy isn’t just a calculated plan of Reaganite coalition-building against the statists. Both traditions need each other, and support each other. 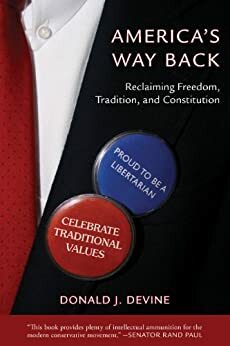 He argues that just as Frank Meyer’s “fusionism” with the traditionalists around William F. Buckley Jr. led to the conservative revival in the 1960s, constructing a new synergy and harmony between freedom and tradition will revive our future today. "America’s Way Back” reminds us that Ronald Reagan didn’t despise government. He cherished a government restrained by the Constitution and the electorate. Devine reminds us that Reagan didn’t merely believe that government was the problem, he maintained that the rapid growth of government “shows signs of having grown beyond the consent of the governed.” He wanted the federal government to recognize that the Tenth Amendment empowers the states, not Washington. “It is not my intention to do away with government,” Reagan proclaimed. “It is rather to make it work – work with us, not over us; to stand gby our side, not ride on our back.” Americans were citizens, not subjects. Reagan had a heckuva lieutenant in Don Devine. It is good to see him now mentoring the next generation of conservative leaders.